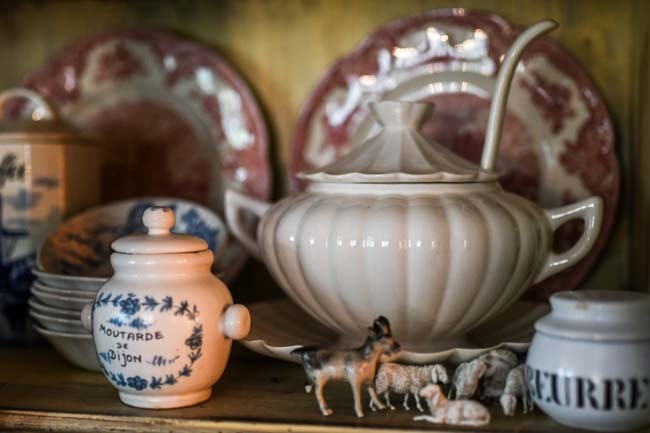 Just what IS a French Country Kitchen? 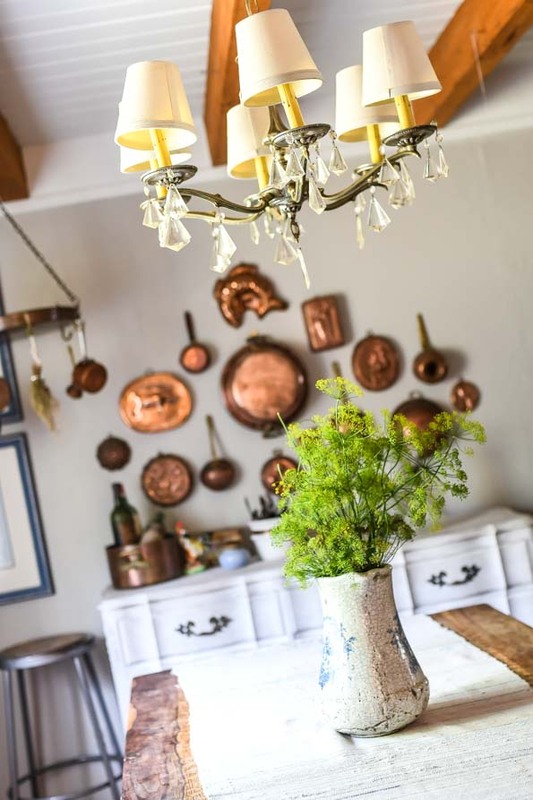 How do you make a French Farmhouse Kitchen? 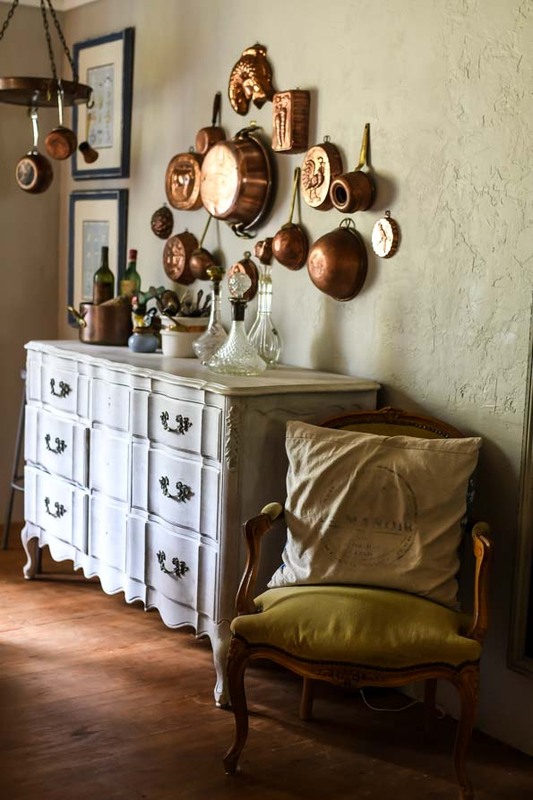 How do you get the look of a real, lived in French farmhouse? The look is more easily achieved than you think. 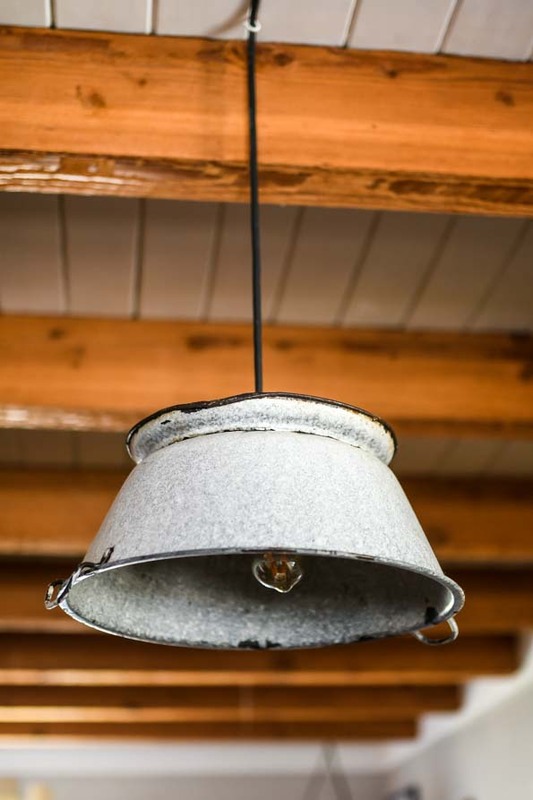 In my recent YouTube two-part video I joked about becoming un-addicted to white shiplap… but really… I want to talk about rustic, crusty, cooked in, homey spaces. Please don’t get me wrong. 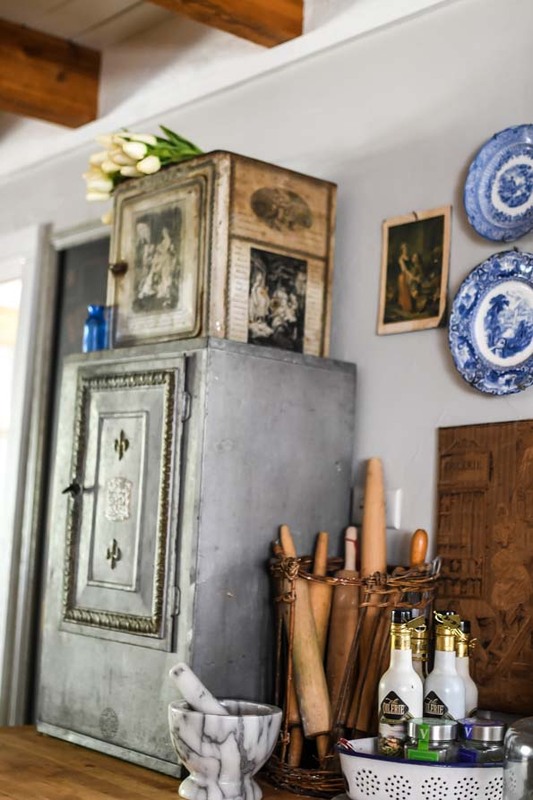 I think those kitchens that are all white, with gorgeous shades of grey and burlap accents of this and that are lovely. They really are. 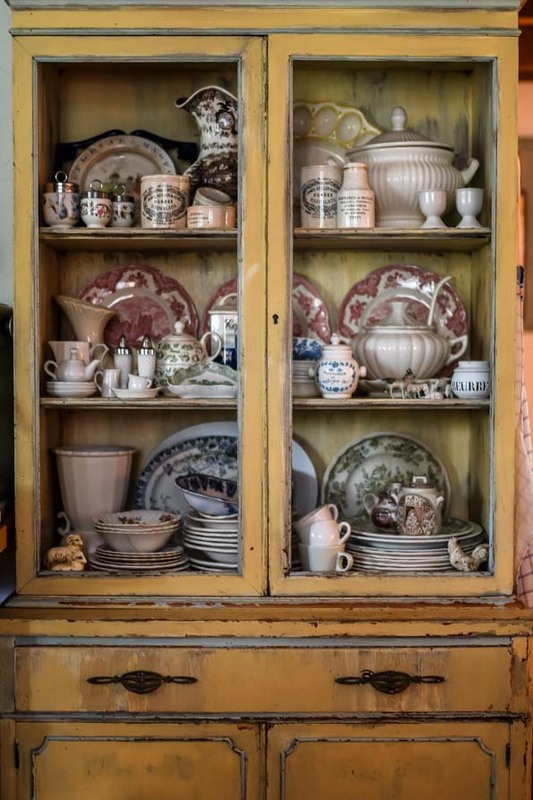 My own mother’s kitchen has a gorgeous, primarily neutral palette…. but you need more cowbell? I need more color. 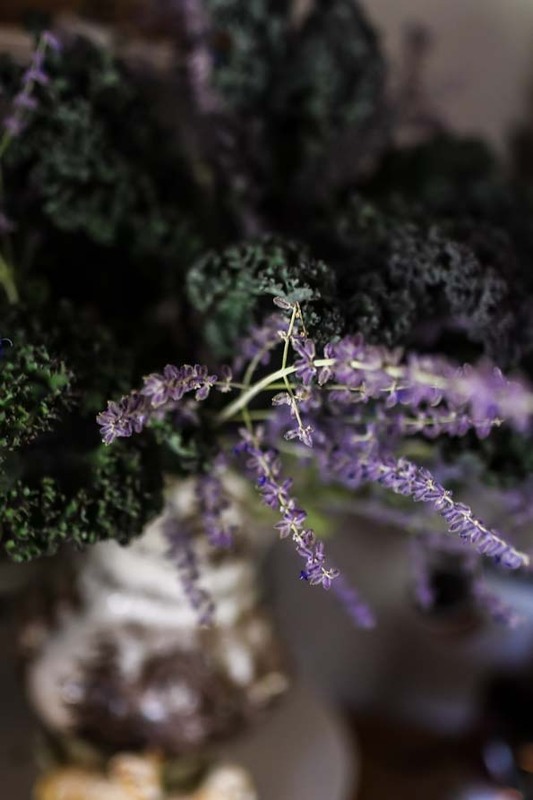 In fact, if you use the hashtag #Frenchfarmhouse on Instagram you’ll be treated to an almost all white feed and sometimes… just sometimes you’ll see a splash of color. Sometimes that splash of color is yours truly. I stick out like a sore thumb. When we bought this house about nine months ago the kitchen was an old lady nightmare. 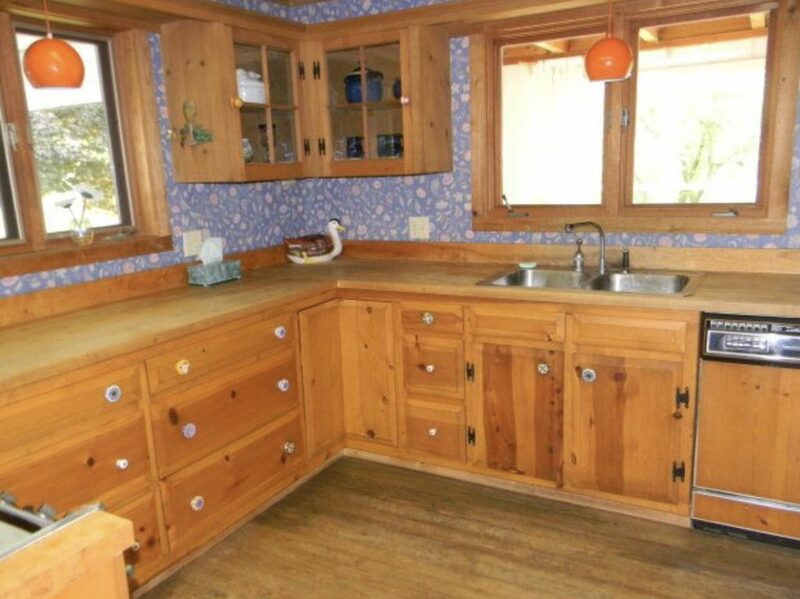 Blue, flowered wallpaper, dark raw cedar cabinets, bright orange IKEA, sperm shaped lighting. A huge pantry pushed out into the room the stove wrapped out into the kitchen with MORE overhead cabinets and in a room with poor lighting from outdoors, it felt like a dungeon. But on that first walk through, I saw beyond all that. 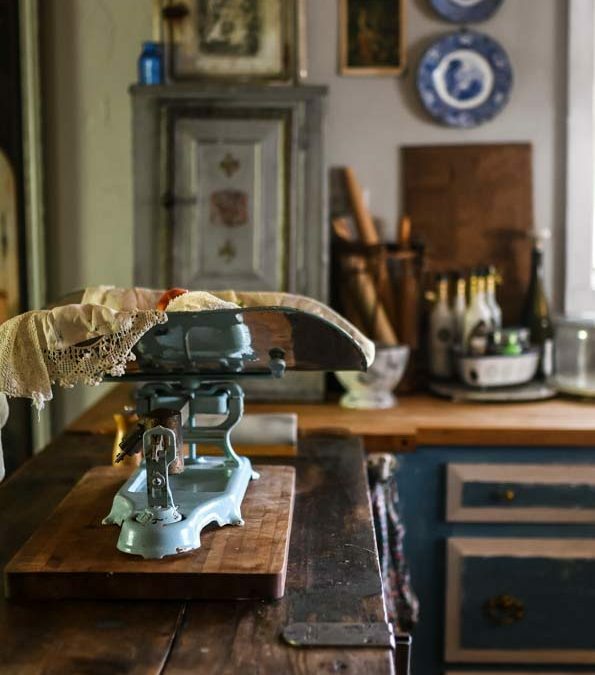 I saw those impressive beams, and imperfectly perfect butcher block counter tops. I saw a place for my twin chandies and for the copper sink I had stored in my barn for the previous two years. I saw a green house right off the kitchen just like at our little rental farm and I saw a place to create the faux fireplace I wanted to feature the range that I didn’t yet own. My wheels were spinning. It took a lot of vision to see past all that blue wallpaper. But we bought the house and ten minutes after moving in began tearing down cabinets. My element of quirky is the birch wood. It’s not a complete thought but we had tons of it and it’s what I had to work with. Would I love cut up barn beams? Sure, but these were readily available. The site of the former pantry. We are on the hunt for the perfect piece of salvaged wood for the mantle but for now… a heavy old door we found in the garage. 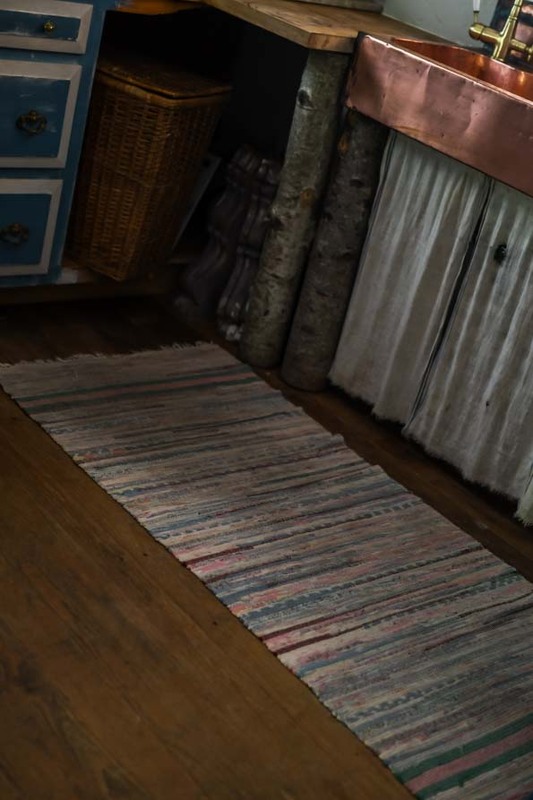 How to you make a French Farmhouse Kitchen? Baskets everywhere. Tout le monde. Plop them in corners, hang them from the ceilings. Be sure to enjoy the vids below to see my favorite baskets. 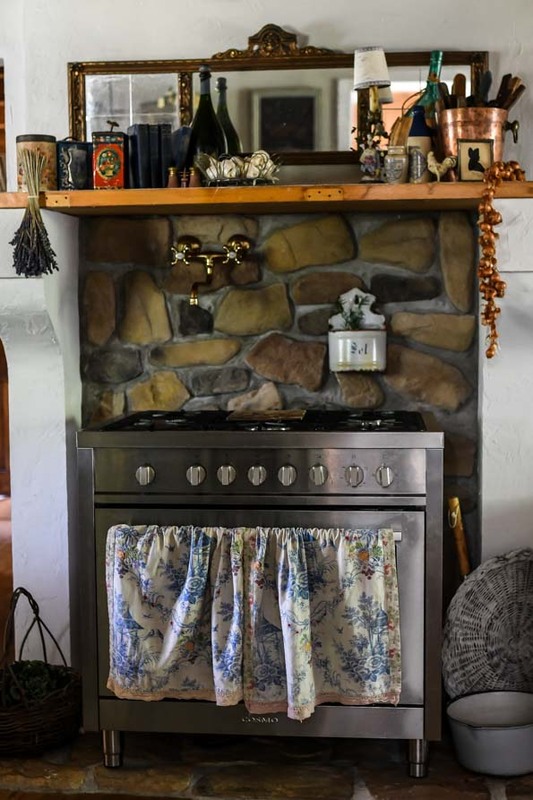 Look, a real old French Farmhouse kitchen isn’t perfect. 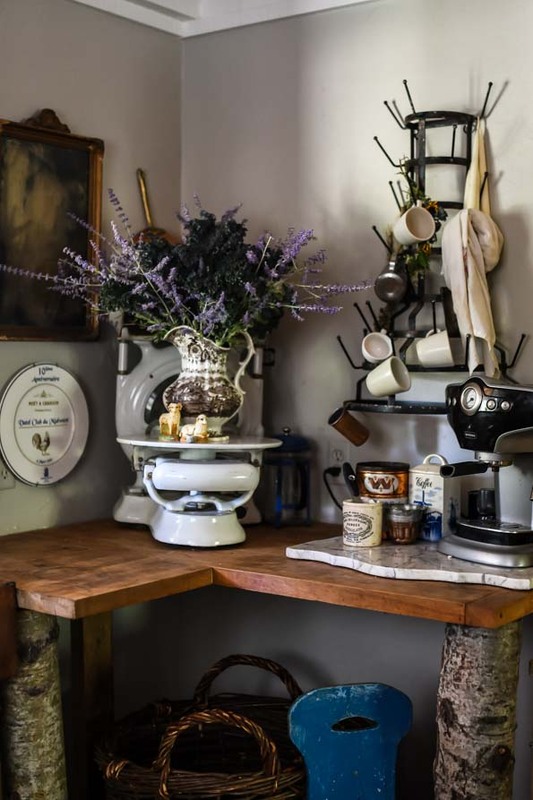 There’s limited electrical outlets, rough-hewn countertops, butcher blocks, pots and pans out in easy access, herbs on the windowcil or hanging from the ceiling. I think if you’re going to REALLY go for it then you have to let go of that über manicured look that American kitchens are so married to. Stuffing coming out of your favorite chair? Found an oil painting you love with a little tear? Want to tear off some wallpaper to showcase your ancient plaster beneath? A crusty mirror over your stove? Mais bien sur. But of course. 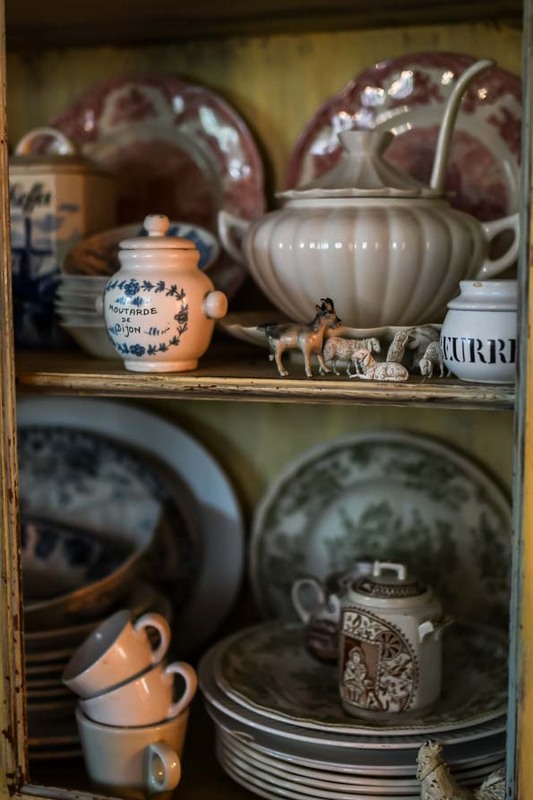 For my house, the French farmhouse kitchen must be an imitation of life. 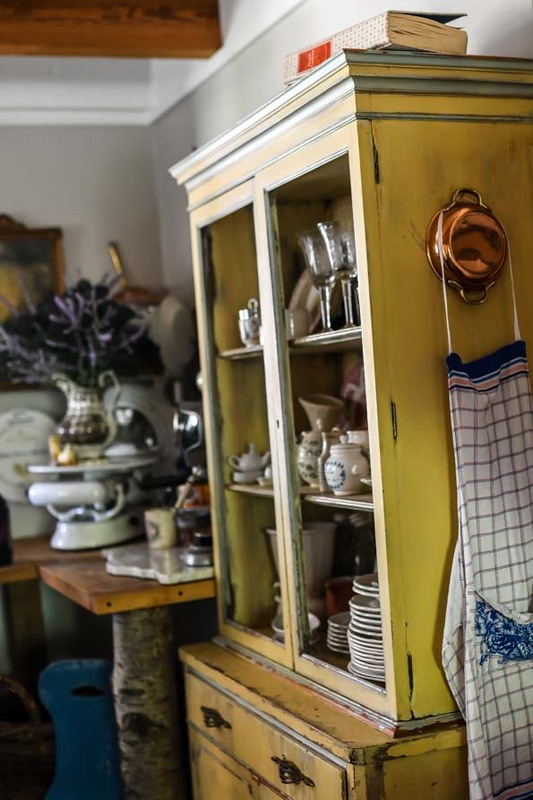 I want my space to actually look like some retched old kitchen in France. 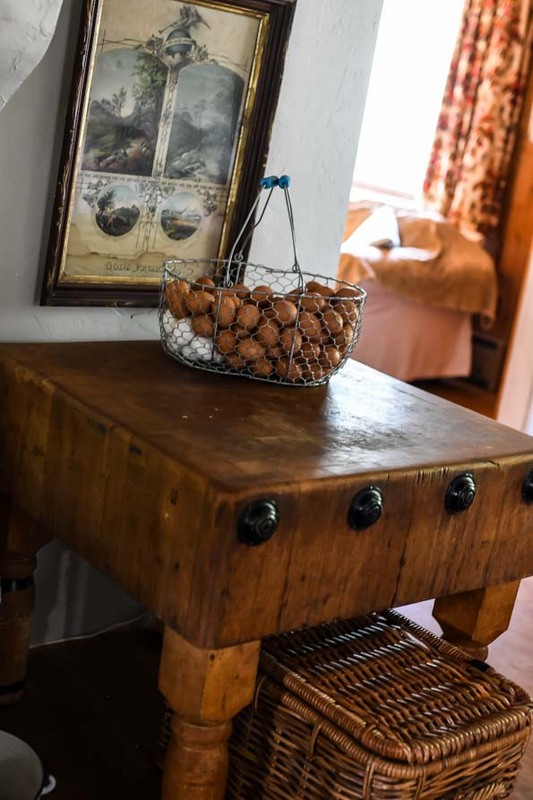 A place where stained wooden countertops have bread rising, pots and pans are used with love, peely dried onions and garlic are withing reach… a comfy place where children can run in from outside for a snack. Pain au chocolat? But am I there yet? I think to create the look I REALLY want I need to be even more brave. A “safe” look is something I don’t want. Does that make sense? I just can’t have an element of showroom. And the struggle is real. Yes, I still really struggle with the perfect paint job Joel did on the ceiling… it’s almost perfect. Shame on me. I know. I should be happy with it. But I’m tempted to lime wash the beams for a true, old barn sort of look. I don’t want to be safe… but it’s scary! Immaculate, groomed, shiny spaces are everywhere and it’s easy to be drawn to them like a moth to the flame. I keep having to remind myself of what I want. Even I, have to keep myself on track and this was all MY hair-brained idea to begin with. It’s been a big challenge to be in constant “deconstruction” mode. I’m used to old houses where you have to do repairs before you can even move forward with your design ideas. 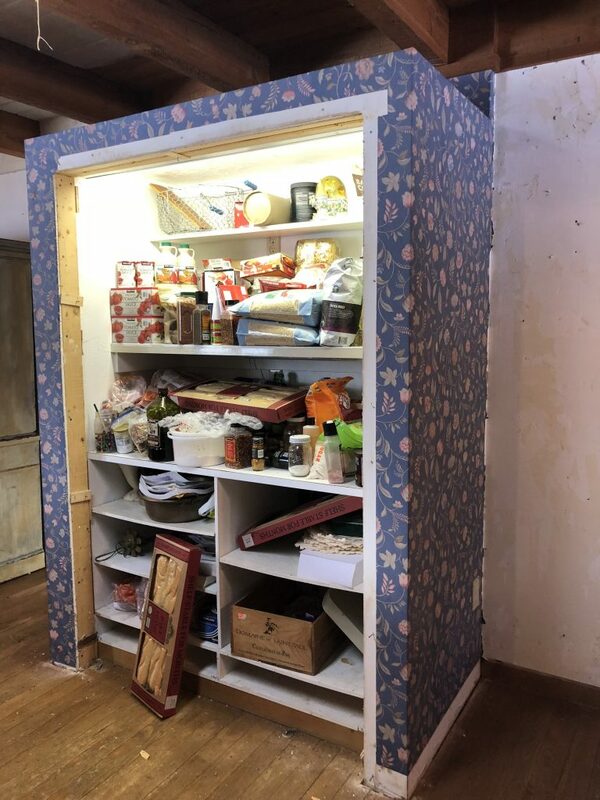 Here, I am having to undo PERFECTLY GOOD things like hand- built cabinets and pantries built so strong they would have lasted the next two hundred years. There’s an element of insecurity as I’m destroying things some people would love to have themselves…It’s challenging to be sure. But when I stop all the brain chatter and look at these pictures I realize I’m on track. 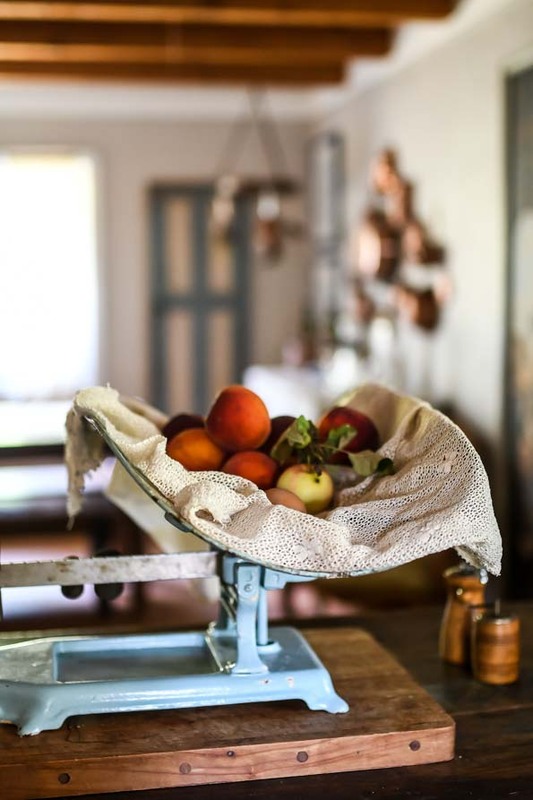 What is a French Farmhouse Kitchen? This is. And I love it. 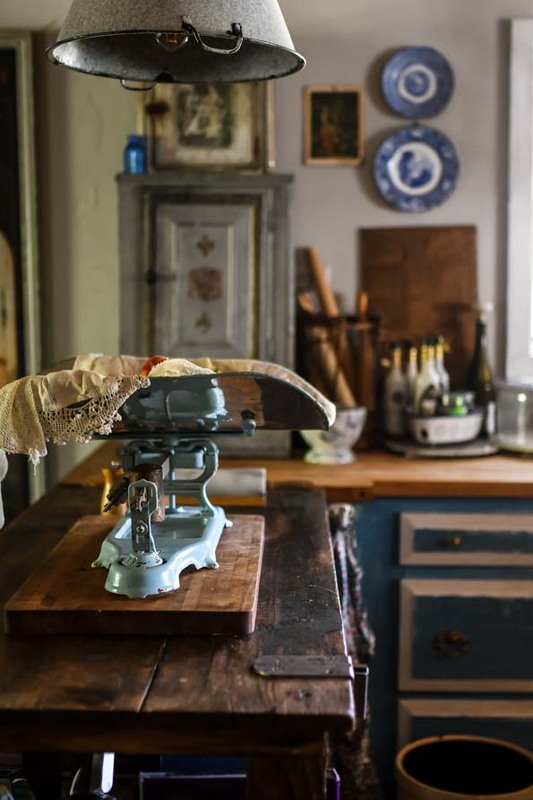 Here are my previous French Farmhouse Kitchens if you’d like to binge. 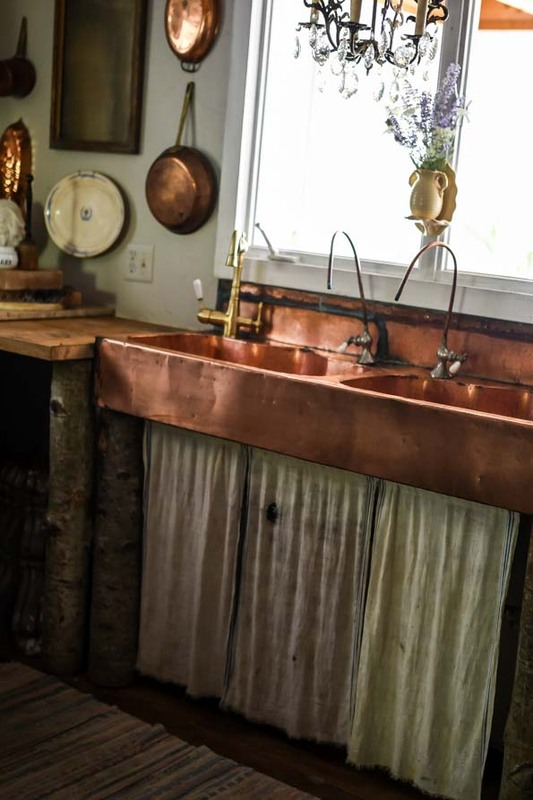 That copper sink looks amazing! But I have to ask, are you constantly buffing out the water stains?? How do you keep it all pink and happy? This blog post was like being surrounded with lots and lots of what you love and just relishing it. The words, the pictures the all of it, loved it. Then I looked at your facebook new photo and script with it and got blessed on top of it all. Thank you for that, more of the best of everything. I thoroughly enjoyed this post and the videos! You’re an inspiration! 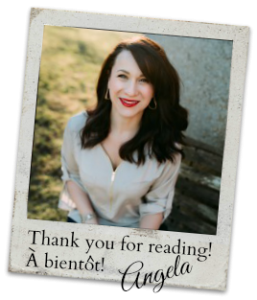 Would love your French pantry list, but it never seems to find its way into my inbox…maybe because I’ve already subscribed in the past? Wondering if others have had the same issue. At any rate, please send me the list, if you have time. Thanks. This year, I’m imitating “Julie and Julia” with a twist. I’m going to cook my way through your cookbook! I’ve enjoyed the few recipes I’ve tried over and over, so I thought I might as well try all of them. Angela, did you take out and leave out the dishwasher? I love the cabinets you took out. I might not have been as brave as you but I adore your kitchen now. Please don’t ever play it safe, I beg you! I love the videos but these still pictures are wonderful to see every small detail. I don’t even have a French country kitchen or house. Mine is a small 1935 cottage that we downsized to last year after 25 years in a 1920 farmhouse and 24 acres. But your rooms inspire me to study on what I can do to my own rooms to make it more authentically mine. Thanks for all the inspiration! Love the color! 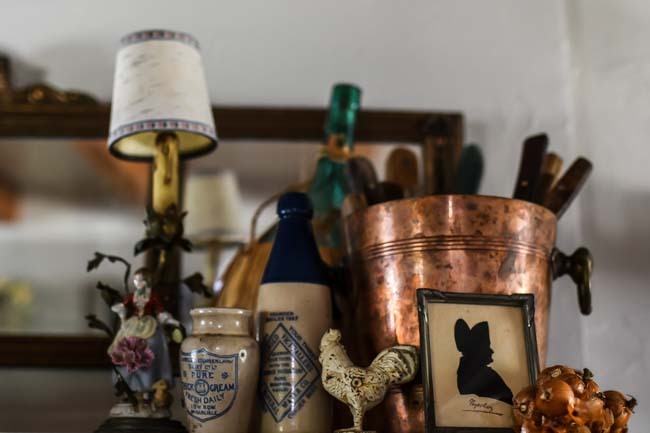 I did a search for french farmhouse decor, and not just on IG. What I found was white, white and more white. Your home is beautifully colorful. I got an email today telling about your day planer. I would like to pre order it. I did not see it on the blog here, what do I do to order it? I was also interested in your signed book. I love this kitchen Angela. The copper speaks to me. As well as the color everywhere, the banged up wood, those awesome birch log supports…those of us that love these crazy rustic spaces are so lucky. To drop a pot on the counter and make another dent is added charm. They can handle all the abuse I give and look better for it (and believe me I am wicked on kitchens). I also TOTALLY hear you about tearing up a perfectly “good” kitchen to get it to where we want it. Right now that is what is stopping me in my own kitchen. Or I should say, stopping my husband as most of the work will end up on his shoulders (sorry husband its the price you pay for being able to do honestly everything). But there are still small things I can and will do to start my kitchen on its journey to France. Right now, to small gold framed mirrors hung by my sink. They make me unspeakably happy. And amen. Have you ever grown flageolet beans in your garden? I read that they use them a lot in French cooking and they are hard to find in stores. So I ordered some seeds to try to grow them this spring and hope for good results. I am looking for advice if someone has grown them. and it came back inactive?? ?